This was quite an achievement by Firies who caused a major shock when defeating favourites Na Gaeil and qualifying for their first Junior Premier Championship final at a well attended Castleisland venue this afternoon. 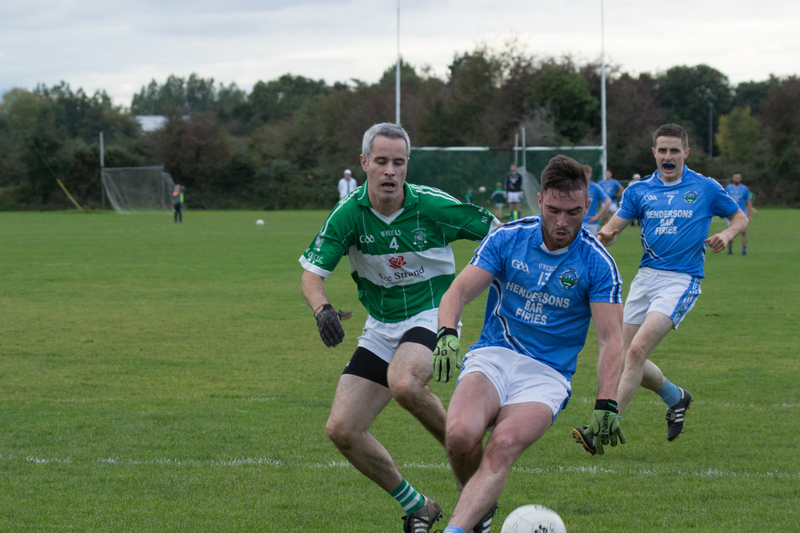 Na Gaeil were fresh from their big victory last weekend when claiming the Senior League Division 3 title while Firies had finished a distant seven points off the promotion places in Division 4. The winners also suffered a hammer blow when losing former Kerry panellist Jack Sherwood and wing forward Shane O’Donoghue to Black Cards inside the opening five minutes of play. By then however Sherwood had left his mark on the game when he weaved his way through the middle of the Na Gaeil defence to slam the ball past Timmy Culloty in the 2nd minute. Sherwood had no sooner returned to midfield than he got his marching orders to be replaced by Kerry minor Donnchadh O’Sullivan who went on to have a major influence on the game. O’Donoghue suffered a similar fate three minutes later but 1-2 to 0-1 ahead, these setbacks did not seem to have an effect on the Farranfore side. Firies were dominating play but were not converting possession into scores until Donnchadh O’Sullivan had a good score in the 19th minute to put his side 1-3 to 0-2 ahead. At the other end, the Firies defence was superb but Na Gaeil did not help their cause by kicking 5 wides. Diarmuid Herlihy replied with a good point for Na Gaeil but Pat Brown and Colm O’Shea had equally good scores for Firies. Andrew Barry was influential for Na Gaeil at this stage and they finished the half on top with good scores from Jack Barry and Mike Griffin but Donnchadh O’Sullivan replied with a fine score for the winners as play swung from end to end and before the break. Mike Griffin and Kerry minor, Niall Donohue swapped points to leave the half time score 1-7 to 0-6 for Firies after a very enjoyable first half that was littered with good scores. Na Gaeil came out a far more determined outfit in the second half and had four points kicked within eight minutes with Diarmuid Herlihy getting two of those to level the game as the Tralee side dominated play. However, just when it looked as if Na Gaeil were going to stamp their authority on the game, Firies struck for two lightening goals within a couple of minutes of each other. First Conal Murphy cut in from the left to shoot past Culloty and then the score of the game as Padraig de Brúin and Donnchadh O’Sullivan somehow worked their way out of a tight situation on the wing, played a one-two and O’Sullivan it was who planted the ball in the net to give Firies a 3-8 to 0-11 lead at the 41st minute. Na Gaeil tried all they could in the next ten minutes as they went at the Firies defence time and again but while they did have 3 pointed frees from Darragh Carmody and another point from Jack Barry they could not get that elusive goal to ignite their fightback and Donnchadh O’Sullivan had also pointed superbly for Firies in between those scores. O’Sullivan with a lovely pointed free from the wing had Firies leading by 3-11 to 0-15 with five to go and then the winners had a let off when Eoin O’Neill rattled the Firies cross bar with a tremendous shot and Darragh Carmody followed with two pointed frees in quick succession to reduce the margin to two points. William Courtney had a super breakaway score for Firies and when Donnchadh O’Sullivan repeated his earlier pointed free from the wing there was only going to be one winner. Firies: Donnchadh O’Sullivan 1-5 (0-2 frees), Conal Murphy and Jack Sherwood 1-0, Colm O’Shea 0-2, Niall Donohue, Pat Browne, Padraig de Brúin 0-1 ech. Na Gaeil: Darragh Carmody 0-10 frees, Diarmuid Herlighy 0-3, Jack Barry, Micheal Griffin and Eoin O’Neill 0-2 each, Seamie O’Neill 0-1.